The Capcom Power Stick Fighter MD (カプコン・パワー・スティック・ファイターMD) or CPS Fighter MD for short, sold as the Capcom Fighter Power Stick GS in North America, is a third-party arcade stick for the Sega Mega Drive released by Capcom. It was released primarily with Street Fighter II': Special Champion Edition in mind. 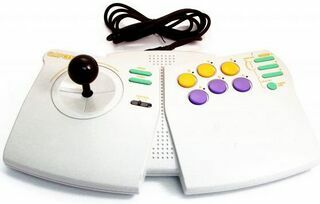 The shell of the CPS Fighter MD was recycled from the original CPS Fighter stick for the NES and Super NES, however the key difference (aside from the different plug allowing it to connect to a Mega Drive) are the different colors - the outer shell itself is white, with purple buttons for and yellow buttons for . Both, the CPS Fighter and CPS Fighter MD, could be used on an FM-TOWNS or an X68000 through the use of an adapter.